With locations in Peterborough, NH, Townsend, MA and Maryville, MO, printing orders can be processed in 3 working days, and shipped via UPS standard ground or next-day air. 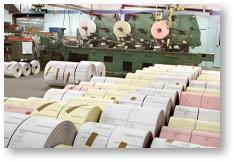 Here's a Plant Tour of the Townsend, MA plant! Here's the Register Forms line - it's not your average small print shop! All presses are custom-built with added technological breakthroughs to speed delivery of these very popular manual forms! 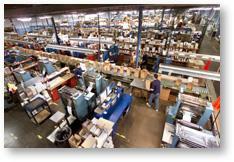 This is a snapshot of the Townsend, MA manufacturing space. 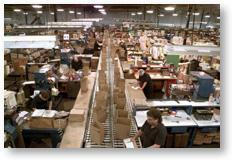 With a spacious 130,000 square feet, Townsend produces thousands of orders each day! 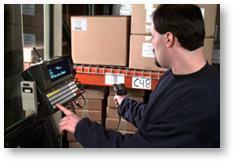 Computerized tracking of raw materials help keep inventories in tack and cost of warehousing low. This impacts the bottom line that helps keep your product costs down! To help further keep product cost low, we manufacture our own base forms. Here's a picture of one of the collators. Now that's a lot of paper!